As Boomers enter the stage of life traditionally called "retirement," extending their years in the workforce is not their only option. 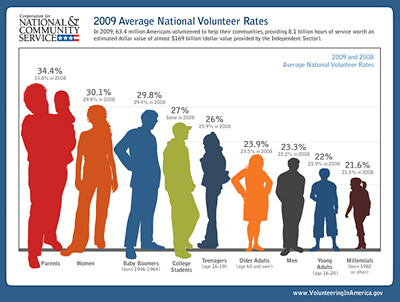 Numerous studies have shown that most Boomers intend to spend some time volunteering. According to Corporation for National and Community Service studies, nearly a third (33.2%) of all Boomers – 25.8 million people – currently volunteer. That’s the highest percentage of any age group, and more than 4% above the national average. These numbers are only expected to increase as Boomers transition out of their full-time careers. At the same time, the scope and number of service opportunities currently available often do not reflect Boomers' diversity, skills, and motivations – nor those of the younger adult generations! To ensure that Boomers continue to volunteer at their current impressive rates, impactful service options that provide flexible project roles, accountabilities and duration need to be developed. Boomers are less likely than older age groups to volunteer out of a sense of duty or obligation, but prefer to put their career skills to good use, learn new things, and make social connections. Through partnerships with existing volunteer resources, or by taking the lead where none exist, public libraries are becoming catalysts for community volunteering and civic engagement. The California State Library's Get Involved: Powered By Your Library initiative builds public libraries' capacity to engage high-skilled volunteer leaders in partnership with VolunteerMatch, the leading online volunteer recruitment nonprofit in the U.S.
70% of Boomers feel they have a responsibility to make the world a better place. Sacramento, CA: Office of the Governor, 2006. Discusses the benefits of late-life civic engagement for both individuals and communities. Dychtwald, Ken and Kadlec, Daniel J. New York, NY: CollinsLiving, 2009.